Stampin' Up! In the Meadow is beautiful for any Nature Lover! This challenge inspired my love for nature! I love 'In the Meadow' stamp set because it has so many opportunities for creative and detailed landscapes! In the Meadow is perfect for one of my favorite techniques! This card shows how masking is an easy way to create depth. This card was created with Stampin' Up! In the Meadow Stamp Set, Layering Circles Framelits, Rose Wonder Polymer Stamp Set, Always Artichoke Cardstock, Soft Suede Cardstock, Watercolor Paper, Stampin' Write Markers, Soft Suede Classic Stampin' Pad, Always Artichoke Classic Stampin' Pad, Island Indigo Classic Stampin' Pad, Night of Navy Classic Stampin' Pad, and Solid Baker's Twine in Emerald Envy. 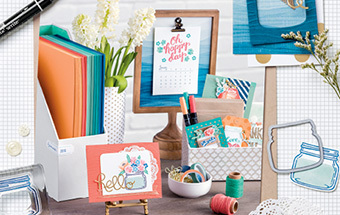 Check out these products, ways to save, and more in the New Annual Catalog! Let's get started with the fun! Start with two 5 x 6 1/4 Soft Suede Cardstock, two 4 3/4 x 6 Always Artichoke Cardstock, and two 4 1/2 x 5 3/4 watercolor paper. Classic Stampin' Write Markers were used on In the Meadow Stamp Set to create the variety of colors in the flowers and grasses. Basic Grey Archival Ink or retired London Fog Memento Ink was used to create the outline of the mountains and deer images. To create the masking use whisper white cardstock and Basic Grey Archival Ink or retired London Fog Memento Ink. Cut out stamped images with paper snips. Stamp images in Basic Grey Archival Ink or retired London Fog Memento Ink onto watercolor paper. Start with the image that you want to be in the foreground then work your way into the distance. Place corresponding mask with re-positional adhesive over image. Stamp images over masks to create the scene. Wildflowers were colored directly on rubber stamp with Classic Stampin' Markers. Remove masks to create the desired scene. Add Soft Suede to deer and to the trunk of the trees with aqua painter. Sponge meadow grass in Always Artichoke. Sky was sponged with Island Indigo. Rip and sponge edges with Soft Suede for lower half and Night of navy for upper half. Mat scene with Soft Suede and Always Artichoke Cardstock. Create sentiment tags with Layering Circles Thinlits die cutting whisper white and Always Artichoke Cardstock. Stamp sentiments in Always Artichoke Classic Stampin' Pad. To create the inside of the card stamp tree and butterflies with Classic Stampin' Write Markers. Sponge edges of sentiment tags in Always Artichoke and mat with Always Artichoke Cardstock. Add sponged sentiment tag and Solid Baker's Twine in Emerald Envy. Mat with Soft Suede and Always Artichoke Cardstock. Send to someone special. Enjoy!